Jacob Tibbs is the runt of his litter. He watches as, one-by-one, sailors buy and bear away his brothers and sisters to be ship cats on other ships – leaving only him and his mother. 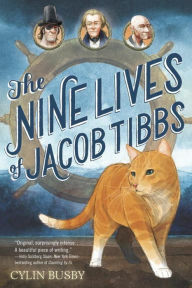 The captain’s daughter begs her father to save Jacob despite his small size and his white paws (that are glow-in-the-dark beacons to the ship rats). And it’s a good thing the captain saves Jacob, because he has his mother’s talent for predicting weather…and a huge storm is brewing. I know I bragged about how awesome my last NetGalley book was, but this book was equally awesome for different reasons. This was just an adorable and fun book to read. I actually learned some interesting tidbits about ships from this book – Busby must have done a lot of research. I’m a cat person, and I loved the way Jacob always explained his actions with cat-like anthropomorphic reasoning (instead of just sounding like a human mind in a cat). I was surprised at how much action could be packed into a book this short. There was always something going on that made me want to read the next chapter. This book was so sweet and fun! I wish I had an appropriately-aged kid to read it to. I highly recommend this book for middle grade readers starting with precocious third graders. While you’re getting it for your child, read it yourself. You won’t regret it.